Sometimes comic books capture a zeitgeist. The pro-democracy movements in the Middle East, the world-wide Occupy protests, the general sense that the priorities of those in power are counter to the interests of those disenfranchised, all point to the fact that people are tired of not being heard. 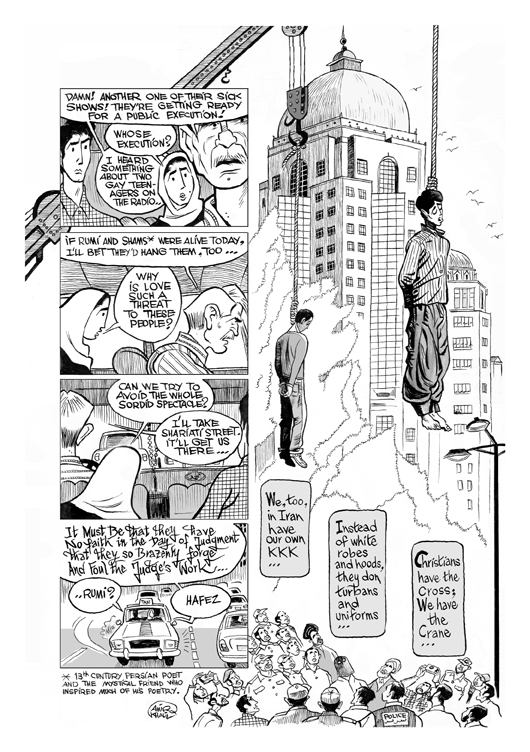 Zahra's Paradise, a new graphic novel from First Second Press by Amir and Khalil, captures this feeling. It is about the peaceful protests that occurred in Iran following Mahmoud Ahmadinejad's 2009 reelection and the subsequent brutal government crackdown. Specifically, it follows the journey of a mother and son, as they search for Mehdi, the eldest son, who disappeared from Freedom Square in Tehran. The background to the story is the June 12, 2009 presidential elections in Iran. There was a heated race between incumbent Ahmadinejad,and the reformist candidate, former Prime Minister Mir Hussein Mousavi. On election day, reports of voter irregularities were everywhere, and the following day Ahmadinejad was declared the winner with a staggering 63% of the vote. After this announcement, both Ahmadinejad and Mousavi declared themselves the actual winner of the election, and the Mousavi camp openly challenged the results. Ahmadinejad claimed that this accusation was actually an attempt by foreigners to undermine the Iranian government. There was a promised recount on behalf of the Iranian Guardian Council while protests began in major Iranian cities. It is said that nearly three million people took part in a rally on June 15th. In the midst of this unrest, on June 18th the Supreme Leader of Iran, Ayatollah Ali Khameini, declared Ahmadinejad the victor. This unleashed government forces on the protesters and ushered in a crackdown where thousands were arrested and beaten, and dozens were killed. Those that were arrested reported being brutalized and tortured, and many of those arrested died under “mysterious circumstances” while in prison. It is within the context of these events that Zahra's Paradise unfolds. (W)e have approached history throught the prism of fiction. Neither of us was in a position to document the facts about Iran's presidential elections. Nor did we want to mislead our readers by presenting Zahra's Paradise as an objective work of history (or journalism) with any definitive claim to the truth or any pretense of neutrality. We have not set out to establish the facts about the anture and extent of fraud in Iran's presidential elections. What mattered to us when we started this project, and what matters to us now, is witnessing the plight and reversing the tragedy that has befallen the Iranian people. This tragedy is personal. Its details and dimensions are unfathomable. It is also legal, political, religious, and cultural. While fiction, this book is absolutely engaging and believable. 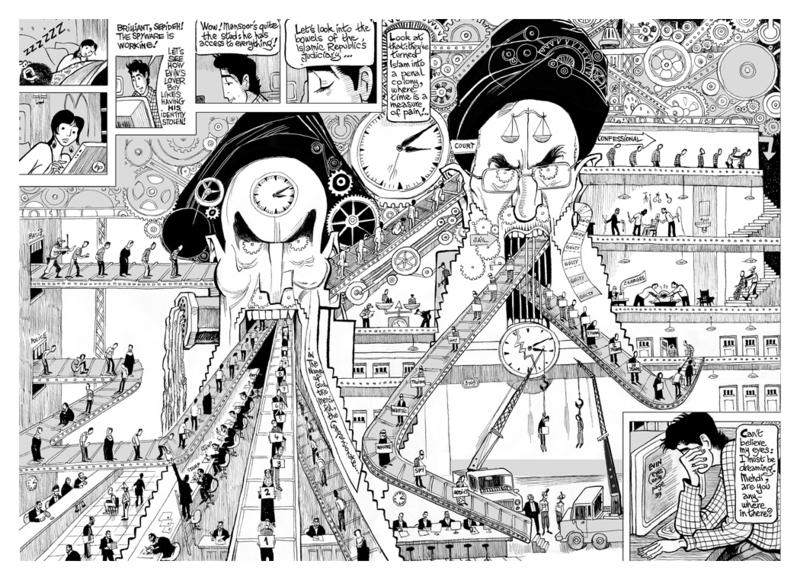 In the tradition of Maus, Persepolis, and the books of Joe Sacco, events drive this story. Amir's writing is emotionally raw, and Khalil's art is at times beautiful, at times horrifying, at times surrealistic, but always appropriate and engaging. Zahra's Paradise is a hard story. The desperation of the mother as she tries to navigate the Kafkaesque bureaucracy of the Iranian government and their denials is palpable. The fear and the anxiety that the Iranian people were living with emanates from almost every page. While the book explores the power of technology in the war against an oppressive regime, it also highlights its limitations. It is an emotionally draining journey and the story moves quickly. The characters are engaging and I found myself immersed in their world. I got confused a few times with some of the names and because I was lacking some fundamental background knowledge, but the creators do provide a rather extensive glossary and historical context in their Afterword. Also in this section is a part titled “Omid” which is a list of the names of the “16,901 individuals executed, shot in demonstrations, or assassinated since the establishment of the Islamic Republic of Iran.” Thumbing through page after page of names is a deadening experience. Zahra's Paradise is an important book. It moves the genre one step further along in its legitimacy. Comics are the perfect medium for this tragedy. It makes the horrible, accessible. The Occupy movement here in America seems to have, at its core, some of the same fundamental frustrations with those in power as the demonstrations in Iran in 2009. 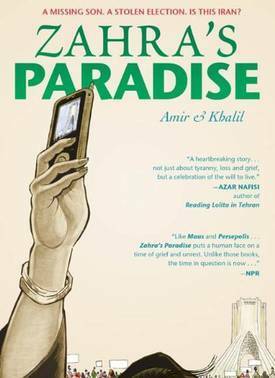 Those that are engaged in the polemic that America is becoming a police state, though, should read Zahra's Paradise before making such accusations.